Choosing which type of material to use for your decking boards is an age-old dilemma & probably the biggest decision you’ll make in your entire project. But don’t worry – our experts have summarised the options available in this easy-to-digest, useful guide that will help to pair you with your perfect structure. Nowadays there are countless surfaces, colours & composites which can all affect the life-span, maintenance, eco-friendliness & cost of your decking. Making the right decision can mean the difference between your decking lasting 5 years or 50 years; between your project costing £1000 or £3000; and between you having to clean & maintain your structure every 6 months or never at all! Section 2: Comparing Boards – How Do They Stack Up? Section 3: Which Boards Should I Choose? 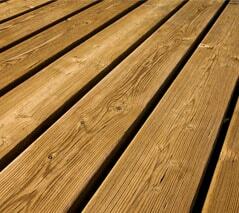 Traditional, low-cost decking wood which has been pressure-treated for durability. They are the most popular type of decking boards with consumers. While they are comparatively easy to install, boards require regular maintenance. More expensive than pressure-treated timber, hardwood decking boards are sourced from tropical trees. They are naturally resistant to warping, splitting & rot; but they do still require regular maintenance. Widely considered as one of the most beautiful decking materials. Made-up of a wood-flour & recycled plastic mixture; composite boards are the new guys on the block! Most composites use a capped exterior to protect against mold, insects & moisture – making them incredibly low-maintenance. Many retailers are so confident in the product that they offer lifespan guarantees. Similar in characteristics to composites, PVC decking is made solely from plastic. This means it is incredibly low-maintenance as it will not warp or split like wooden alternatives. However it is one of the most expensive options & can sometimes look quite artificial. Section 2: Comparing Boards - How Do They Stack Up? The most affordable & simplest decking boards are undoubtedly pressure-treated softwoods. They are widely available from a majority of DIY stores & their availability means you can afford to be picky with who you buy from. However it’s still important to buy your boards from a reputable supplier, or you may risk poor quality boards which have been stored improperly & may be warped & cracked. And remember that what you gain in affordability – you lose in maintenance commitments & product lifespan. Before you buy, read our ultimate guide to softwood decking. If you’re looking for minimal maintenance then you should probably steer clear of wooden structures. To keep them in good nick they need sanding down & treating at least once every three years – as well as more regular cleaning & upkeep to keep the deck free of organic matter. And while hardwoods are fairly durable, those with low-maintenance requirements are recommended to look at composite or PVC solutions. Because these make use of plastic materials, they are generally resistant to mold, moisture, insects & UV rays. This means they generally won’t split, warp or fade and need very little ongoing maintenance. Because of its incredible resistance to the elements, PVC decking is generally recognised as the ultimate in low-maintenance decking boards. Before you buy, read our ultimate guide to PVC decking. The look & feel of your deck is of course a matter of personal opinion – what looks good to one person might not look so great to another. But most experts agree that hardwood decking boards are difficult to beat for their natural allure, deep warm colours and their beautiful surface textures. The dark reds & browns which the wood achieves naturally can sometimes look artificial when used in composite & PVC imitations. However manufacturers are getting better at making PVC & wood-plastic composites look like the real thing. Nevertheless, our experts feel that if you’re looking for that real ‘wow’ factor, you can’t go far wrong with a beautiful hardwood deck. Before you buy, read our complete guide to hardwood decking. Now this is a tough one! Unfortunately there is no hard & fast champion for the environmentalist buyer – and all decks will have an unavoidable impact. But this can be minimised by making informed choices. The least eco-friendly options are probably pressure-treated wood (because of the toxic chemicals used in its production & its contribution to deforestation) and wood-plastic composites (because mixing the two materials together means they cannot be recycled after use). Our preferred option is probably PVC plastics because not only are the boards often made from recycled plastics, they can be recycled again after use for new purposes. Like all options, PVC does have its downsides, though. We recommend doing your research & making a choice to suit your personal circumstances. You can always look to offset the carbon emissions caused by your build separately & look into proper disposal of your leftover decking materials. One of the reasons pressure-treated softwoods are so popular (aside from their affordability) is the fact they are so easy to work with during installation. It is incredibly versatile & can be cut & fastened with incredible ease. However if it’s easy installation you’re looking for, you might want to look into the custom fastening systems which are available with more premium builds. Many hardwood, composite & PVC decking structures offer these systems as standard & help make the installation much easier as the boards simply click into place with joist fasteners. If long life is the most important thing from your new build, you’ll likely need to look further than wooden boards. Pressure-treated boards will usually last no longer than 15-20 years; and while hardwood structures are naturally resilient, they are still prone to wear and tear over a number of years. You’ll likely get the longest life from either capped composite boards, or PVC plastics which contain zero wood & therefore won’t degrade in outdoor weather. Wood-plastic composites are claimed to last over 25 years while the manufacturers of PVC decking claim the boards can last up to 40 years with very little maintenance.